Tinariwen are one of Mali’s most successful bands. Malian music is more or less dominated by powerful and iconic characters. Many of course play with support bands, but on festival billings and album covers the name is usually only the name of the superstar member playing the dominant instrument e.g. Ali Farka Touré and Toumani Diabaté. Naturally, therefore, Tinariwen being a band means that their songs are dominated less by one instrument, building instead songs where each instrument contributes to the rhythm and are varied in tempo, style and mood. The band itself can be seen as a case of successful demobilisation, at least on a micro scale, despite devastatingly impoverishing conditions. Many of those that fought in the war were not as fortunate. After the ceasefire of 1994, the band – already gaining in popularity regionally – moved back to Mali. In their own words they “became the spokespeople of a generation which looked on helplessly as their harvests thinned, their animal herds wasted away and their world slowly crumbled.” Each successive album has been a greater and greater success and their international stature only seems to increase. Tinariwen is obviously made up of emotive and hardy people. The keen-spirited nature of “Tenere Taqqim Tossam” and the album “Tissili” is a perhaps intentional. The band point out that the album was their first attempt to “ditch” the gun-wielding image of the band described above. A new album is apparently on its way, as is a UK tour, however details are thin on the ground. We will have to wait and see if and how the events of the years since “Tissili” was released in 2011 have affected the bands musical compositions. It’s Wednesday morning and that means only one thing: it is time for a song from Mali. Today we are delighted to introduce our first musician of Tuareg heritage to feature on the Track of the Week: Omara “Bombino” Moctar. The Tuareg or Kel Tamasheq, as they refer to themselves, have their own deep musical, political, and religious history that is well worth exploring. Andy Morgan has recently published a book that goes a long way in explaining this history and perhaps can begin to help one understand how the Tuareg often struggle in modern Malian life, including with the issue of their independence and their involvement in the country’s current armed conflict. Bombino himself has an incredible life story which can be read in great detail here. He was born on the first day of 1980 in an encampment of Nomadic Tuaregs in Niger and his life can in many ways relate to the issues outlined above. After the droughts of the mid-80s and during the conflict on the early 90s Bombino – through chance – found himself in possession of a guitar. The guitar had recently been adopted by the Tuareg as a way of projecting their teachings and values through song. At an age not much older than 10 he began to teach himself and after a while Bombino found himself incorporating his music into political rallies and other cultural crafts – including cinema. He even managed to land a role as an extra in a French film that explains the origin of the title of this song of the week. We have found this delightful live rendition of his and his band’s song “Imuhar” in the link below. Like most music from Mali and the Sahel it takes on an ever-greater energy and purpose when performed live. Bombino is performing live in London on the 25th October. We’ll probably see you there. In this regular post we’ll be providing key links to keep you up-to-date on the latest in Mali. A fairly crisis-centric post this time around, but we intend to change that in future to reflect there is still much more to Mali than the current crisis. 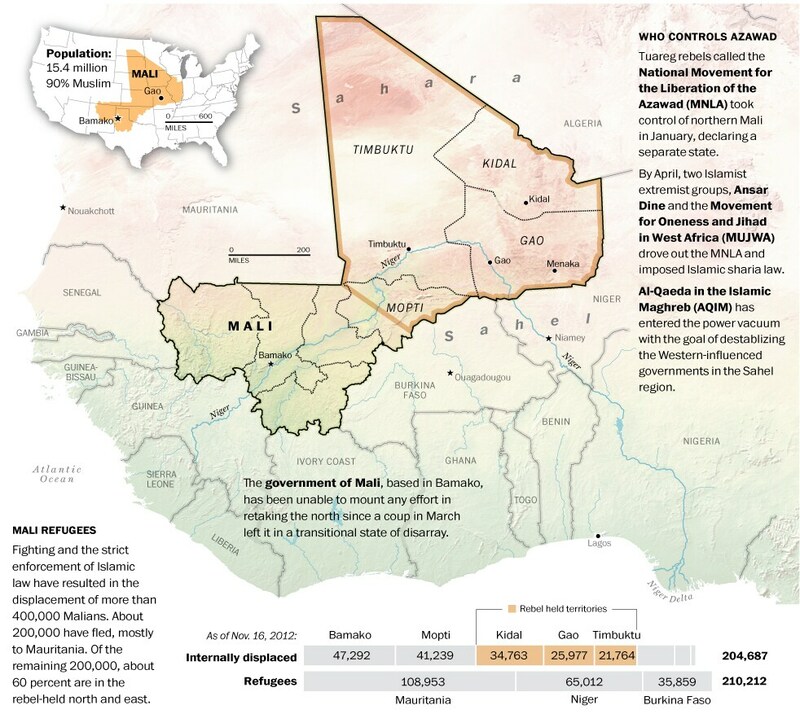 First up, a fantastic infographic from the Washington Post on the current situation in Mali. And the Washington Post also reported on the silencing of music in Mali, as did the BBC in a very vivid report highlighting the terrorist’s assault on one of the Mali’s most iconic features: it’s music. All while these foreign terrorists who are implementing this are calling for Malians to reject foreign troops… words escape me to describe the hypocrisy. I’ll just balance this piece off with something from allafrica.com talking about the politics of ethnicity and locality. Ban Ki-Moon recommends the deployment of AU troops to Mali, while US military officials indicate worry about the effectiveness of military intervention. Meanwhile, more importantly, Toureg representatives attend mediation talks. A very important first step as the UN was told late last week by Jeffrey Feltman, Under-Secretary-General for Political Affairs. This is especially important when we consider that the Malian Army has just opened recruitment for 15,000 men, (fr) three times the numbers of the proposed ECOWAS intervention force, giving some indication of the scale of the task that the Malians might forsee, and why dialogue is a strong preference. The Malian Prime Minister and his government have resigned late last night following his arrest (fr) at the instigation of the leader of the March coup Captain Sanogo.